The Innoscan 710-IR is capable of reading signals in the near-Infrared spectrum. This allows for a considerable reduction in the background noise caused by supports normally used in protein microarrays such as nitrocellulose or PVDF. Increased sensitivity of protein microarrays thanks to Infrared fluorescence detection: with its two sources of excitation in the near infrared spectrum (670 nm and 785nm), it is possible to read slides with nitrocellulose or PVDF substrates without the problem of auto-fluorescence caused by these supports. This translates to an increased sensitivity of tests by considerably increasing the signal/background noise ratio. Real-time autofocus which is optimized for nitrocellulose or PVDF substrates: The Innoscan 710-IR scanner uses a real-time autofocus system which produces a perfect homogeneity across the entire reading surface. A special configuration made for the program, Mapix, allows users to adapt the autofocus system to nitrocellulose or PVDF formats. Speed: With an adjustable reading speed of 10 to 35 lines per second, users can obtain test results very quickly (4 minutes to read an entire slide with resolutions of 10 µm/pixel). Proteomic : High-throughput protein expression detection. Cell signal studies: profiling of proteins and protein activity tied to cellular signal pathways. The Innoscan 710-IR is a confocal fluorescence scanner equipped with two excitation lasers (670nm and 785nm) and two photomultiplier tubes (PMT) as a detection system. The PMT detection system is extremely sensitive and perfectly linear across the entire function range (0 to 100%) thus allowing users to adjust the PMT gain of each wavelength independent of the other. 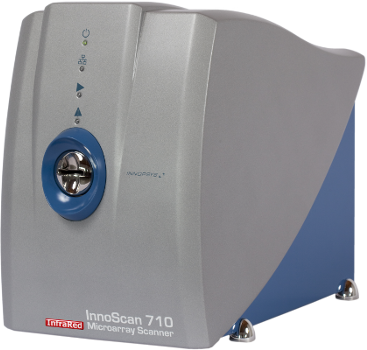 As the Innoscan 710-IR contains a real-time autofocus system, users have the advantage of eliminating the effect of substrate deformation, thus allowing a perfect homogeneity across the entire reading surface. Innopsys’ InnoScan scanners are known for their excellent photometric properties, notably in terms ofsensitivity and signal to noise ratio (SNR).